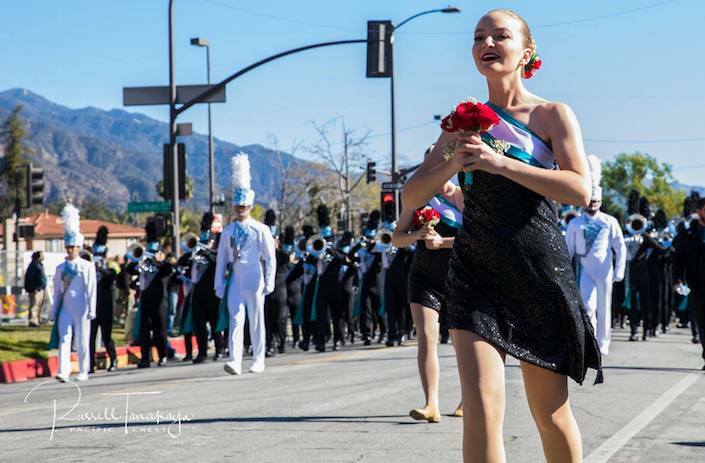 Pacific Crest began the new year and capped off its silver anniversary by performing at the 130th Annual Rose Parade on January 1, 2019, in Pasadena, CA. 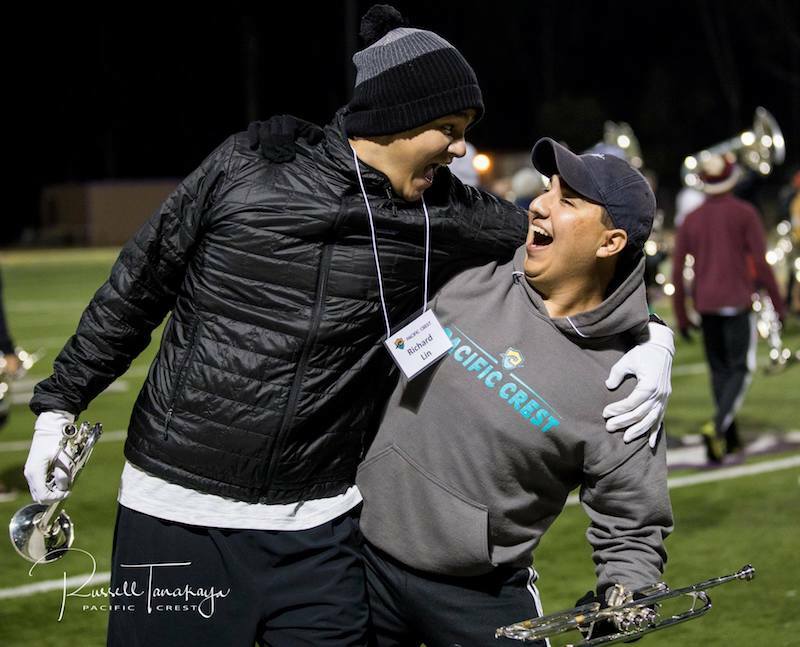 Below is a day-by-day recap of the Rose Parade Tour, as told by its performing members. While most were enjoying a week of rest for the holidays, 190 Pacific Crest performers moved into Diamond Bar High School the day after Christmas to begin rehearsing for a five-day mini-tour, which would end with a historic performance at the 2019 Rose Parade. Although members and staff had been preparing music for months, it wasn’t until the end of December that the entire ensemble—including alumni spanning nearly every year of Pacific Crest’s 25-year history—convened for the first time. Diamond Bar City Council Member Nancy Lyons (center), pictured with the parade banner, which was funded by the City of Diamond Bar. All-day rehearsals culminated in the group’s first public performance, a community showcase at Diamond Bar HS on December 28. 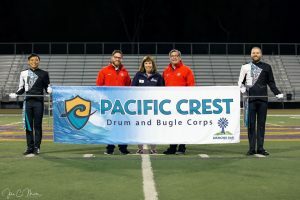 During the performance, the ensemble revealed the banner that would introduce the corps at the Rose Parade, which was sponsored by the City of Diamond Bar. The corps went on to perform at BandFest at Pasadena City College on December 29, playing a collection of pieces from previous years’ repertoire, including music from Pacific Crest’s 2018 production Here’s to the Ones Who Dream. 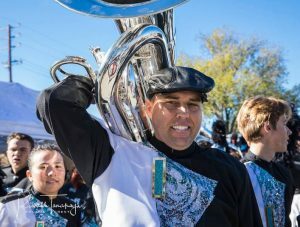 The two-day BandFest event featured music ensembles from across the globe, representing 11 US states, Costa Rica, Puerto Rico, Sweden, and Japan. The ensemble marched in the Disneyland Parade the following day, delighting park-goers of all ages with a rousing performance of “California Dreamin'”, the opener from the corps’ 2017 production Golden State of Mind. A final day of rehearsal took place December 31 before a 4:00am wake-up time on the day of the 130th Annual Rose Parade. The parade kicked off at 8am at the corner of Green Street and Orange Grove Blvd. in Pasadena. Pacific Crest contra player Damian Gonzales noted that marching five and a half miles down Colorado Boulevard was “not easy,” but knowing how much the performance meant for the organization and its alumni was well worth the challenge. The corps added an additional tune for the New Year’s Day performance, the crowd favorite “Theme from Shaft”, arranged by local band director and former Pacific Crest brass staff and arranger Brian Belski. The corps’ performance was featured on several news outlets, including NBC and ABC Channel 7 News. Pacific Crest is only the third world class DCI corps to perform in the Rose Parade in the past 35 years, joining the Troopers (who performed in 1985) and the Santa Clara Vanguard (who performed in 2004 and 2017). 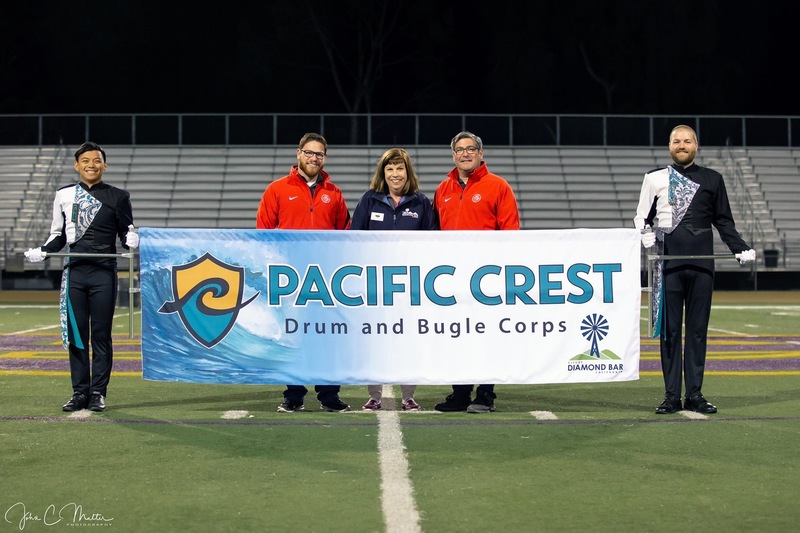 It is a fitting honor for the organization, which was founded in 1993 in Diamond Bar and has grown into Southern California’s premiere World Class Drum and Bugle Corps. Thank you to all of our staff, supporters, and all members past and present for making this historic appearance possible!